The WRB322DMB 22 Cu. 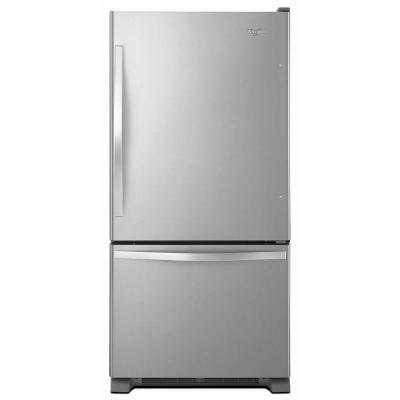 Ft. Energy Star Qualified Bottom-Freezer refrigerator with freezer drawer comes with featured designed to fit your lifestyle. Thanks to the Accu-Chill temperature management system, you'll be able to keep storage at the right etmperature, by using the built-in sensors to activate the compressor when necessary. Plus with the SpillGuard glass shelves, clean up will be quick as leak are contained to prevent spilling. And to keep fruits and vegetables fresh and tasting great, FreshFlow produce preserver gets rid of ethylene gas that causes spoilage. SpillGuard glass shelves help you contain leaks and spills for easier cleanup. Adaptive Defrost sense and adapts, running the defrost cycle only when necessary. Energy Star qualified refrigerators exceed federal minimum standards to conserve natural resources and help save money on utility bills. These eco-friendly appliances are better for the environment and your wallet. Depth with door at 90 degrees:: 62"
Drawer Clearance with Handle:: 50.75"
Coupon Details: Get $295.10 OFF automatically when you add this item to your cart! Regular price of $1434.10 will be shown prior to adding it to your cart.